Reading through all the comments on previous stories, I'm gathering that there's still some indecision as to whether to put the beloved Nokia Lumia 1020 up to Windows 10 Mobile, against Microsoft's official advice, via the Insiders Program and its 'Threshold' Release Preview ring. In an attempt to come down again on one side or another, here are my top 10 reasons why you should definitely keep the 41MP-sensored monster on the older OS. This is huge and possibly one of the biggest reasons why the 1020 never made the 'official' cut for Windows 10 Mobile. This can make a big difference when shooting live music, one of my favourite things to do with smartphones. Glance under Windows 10 Mobile doesn't move around the screen, meaning potential burn in of some AMOLED pixels, unless you cripple Glance by making it auto-turn off after a few minutes. In addition, you can't set an image as your Glance background, even mirroring the lockscreen. I love the way a three day weather summary can be overlaid on the 1020 under WP8.1 by simply waving my hand over the screen. It's magic. And always makes jaws drop. Sadly, Windows 10 Weather isn't compatible with Glance - in fact, I'm not convinced Microsoft's programmers ever really got to grips with the subtleties of Glance, which was a Nokia innovation (started properly with the N85 in 2008). The strength of Windows Phone, right from the start, was that the user interface was silky smooth and responsive. Unfortunately, on the dual-core devices like the 1020, the UI feels at times like wading through treacle. The WordFlow 'Swype' keybard lags behind one's finger gestures, you can almost watch the painting of the light trails after finishing a word. And don't get me started on long 'Resuming....' waits generally (yes, more so even that on Windows Phone 8.1). To be fair the UI of Windows 10 Mobile is easily fast enough on most of the more modern devices, but it's a bit of a disaster on the 1020. Which, again, is why the feedback from this device prompted Microsoft to exclude it from the official approvals list for the new OS. And rightly so. 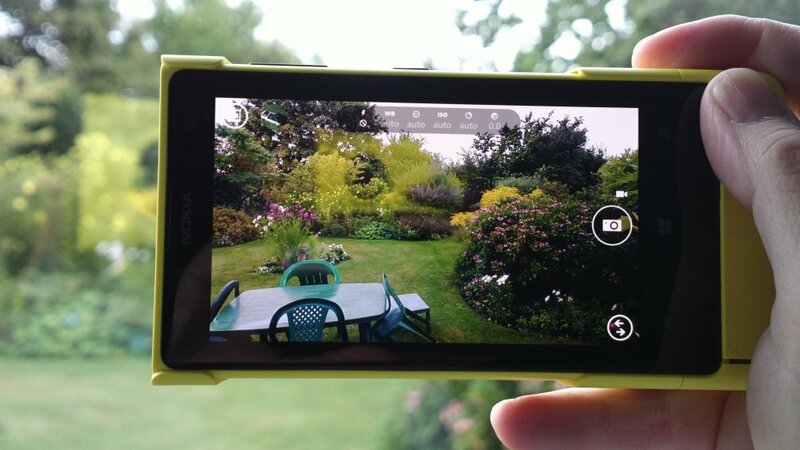 Lumia Camera, the recommended camera app for the 1020 under Windows 10, and Windows 10 Photos don’t fit together well After reframing an image (one of the core USPs of the 1020, you may remember, with the dual capture at 5MP/38MP, and an operation which still has to be done back in Lumia Camera), the image shown on-screen in Photos is always the previous, pre-reframe image, and I always have to go back to the 'thumbnail' view, wait for refresh and then step forwards again. In fairness, HERE has stopped updating these applications for Windows Phone 8.1, but they work just fine and still plug into the offline maps and online traffic systems. So why not carry on using them? Certainly many people have praised the HERE interface (especially for Transit) over the initial Windows 10 Mobile Maps implementation. Suffice it to say that HERE's apps (which started as Nokia/Ovi Maps, of course) have lots of fans still, and these applications are about to stop working under Windows 10 Mobile, probably when 'Redstone' gets released to production devices. While Insider builds have been improving, Windows 10 Mobile is a 'heavier' OS and not as fine tuned as Windows Phone 8.1 became - expect double the battery drain per hour in standby mode and to be out of power by tea-time every day. This is perhaps the biggest objection of all. At some point in mid-2016, the flow of updates through the Insiders programme will stop for non-Win-10-approved devices. Leaving an Insider-upgraded device with potentially showstopping bugs and/or insecurities. A very significant difference then on the two Lumia 1020s - a 59% increase in time taken if you add it all up. And if you take away the boot time (assuming that people don't restart their phone every morning) then it's much closer, for the day to day operations, to a ratio of 2:1. Now, it's true that many operations on a smartphone will run at the same speed, such as when an application is on-screen and the user is interacting with the UI, but I don't think the operations listed above are that outrageous, and are intended to be real world tasks. So we're talking of a factor of two, i.e. most things on the Lumia 1020 will take twice as long under Windows 10 Mobile as under Windows Phone 8.1. And this is certainly borne out in my own experiments - living with a fully loaded 1020 under the Insiders Programme, even with the latest build, is certainly possible - but at times frustrating.